Hello readers, I’m finally back after one week of absence from here. What have I been doing so far? Well, after my Vietnam trip that lasted from Tuesday to Friday last week, I had a bit of rest on Saturday, which unfortunately was morphed into a horror of a food poisoning on Sunday. Complete with diarrhoea, vomitting, and fever. I slept most of the Sunday away but I feel better today. Still having some cramps and diarrhoea, but I’ve seen a doctor and gotten some medication (was diagnosed with bacterial infection in the tract), and hopefully I’ll be perfectly fine in a couple of days. So what new acquisitions have I gotten lately? One nice “signature pen” which I will review another day, and two new kikki.k gel pens, which I will briefly share about today. 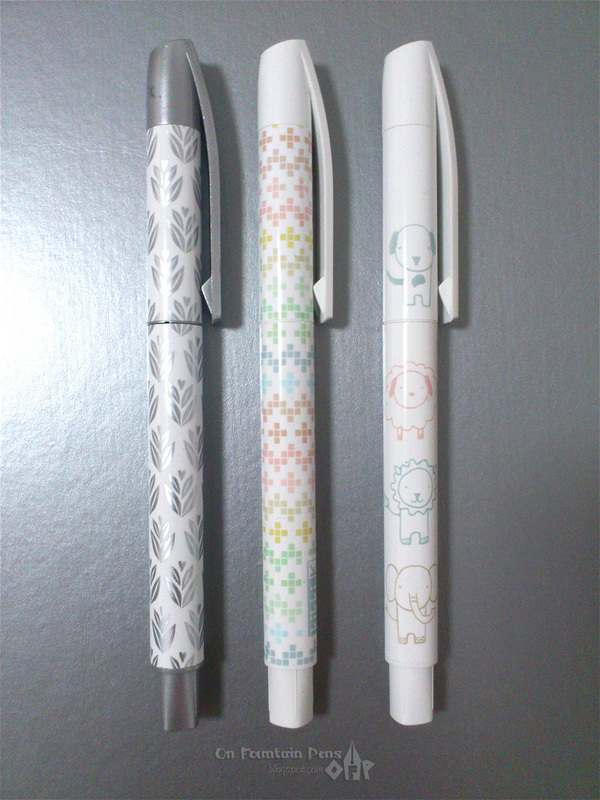 The two pens are respectively named Rainbow Stitch and Bebis. Rainbow Stitch is probably thus named because of the squares of colour that make up a spectrum from one end of the pen to the other looking like a work of cross-stitching or embroidery. Although I would probably call this “Rainbow pixels instead”, to “keep up with technology”. Bebis is the Swedish word for “baby”, and you can see cute baby animals printed on the pen! I love entire spectrums of colours, especially when I enter a clothes shop, for example, and I see T-shirts arranged down an entire row, with almost every shade of colour available. I also love different shadings of the same hue, like super light green, light green, green, slightly dark green, dark green. These ranges of colour always make me excited. I guess that is one of the reasons for me liking stationery so much. Imagine looking at a box of colour pencils or crayons like the Faber-Castell Art & Graphic Range – doesn’t it make you drool? So that’s why I knew I had to get the Rainbow Stitch gel pen when I set my eyes upon it. The Bebis pen has little animals printed on it. With a dog, a sheep, a lion, an elephant, a cat, a rabbit and an owl. They are really simple pictures of animals and really look like something targeted towards kids. Although, if you are a crazy stationery adult like me or someone who is always young at heart, you could very well get a Bebis pen to indulge in. Who said only anti-ageing cream can help you stay young? Stationery can do so, too! If you have read my review of the Silver Flower gel pen, you’ll have an idea of how much I like it. The two new pens did not disappoint either. Same quality. The only differences are the patterns printed on the outside, and the cap and end colours (Silver Flower is silver while the other two are all white). Let me also add that the whiteness of the Rainbow Stitch and the Bebis pens add even more to the appeal of the products, in my opinion. They give a very clean, bright feel coupled with light pastel colours. It’s something that could be suitable for all ages! The only down side is probably that you probably won’t bring the Rainbow or Bebis to an important business meeting. For that, the Silver Flower will probably be a little more appropriate. For those interested to purchase the pens online, the Rainbow Stitch can be found here and the Bebis right here. Have you gotten your kikki.k pens yet? How was your experience? MJ – I've asked kikki.K and they said no store in the States. But they would love to expand to the States, so, keep fingers crossed and hope it will be soon! Otherwise, you can buy from their online store which is linked in my post. Azizah – Thanks a lot for your concern, I've seen a doc who gave me antibiotics and now I'm well again. 😀 Back to eating all my favourite foods again! Welcome back!! I'm so sorry to hear about your food poisoning! WORST FEELING EVER. I'm glad you are recovering. Stay hydrated 🙂 (I once ate rancid salmon. I know how you feel.) 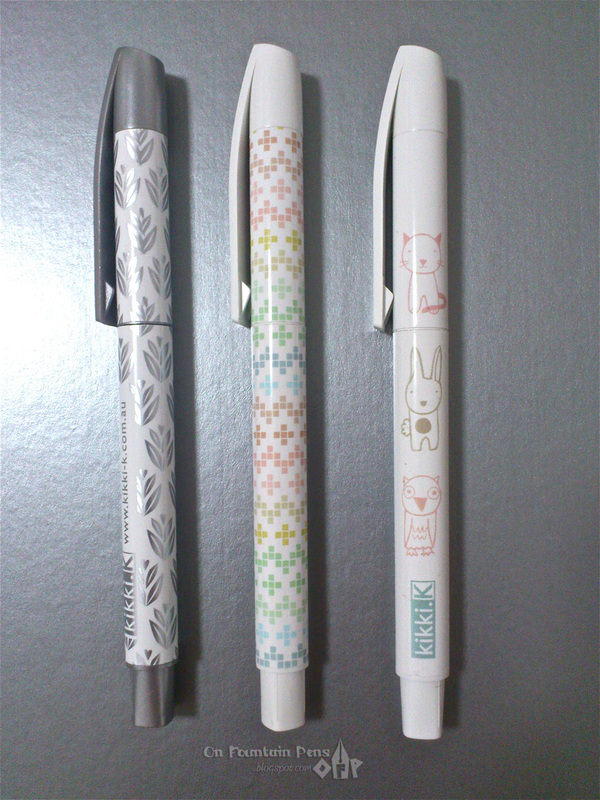 These pens are sooo cute though (your misery aside, sorry). WANT.